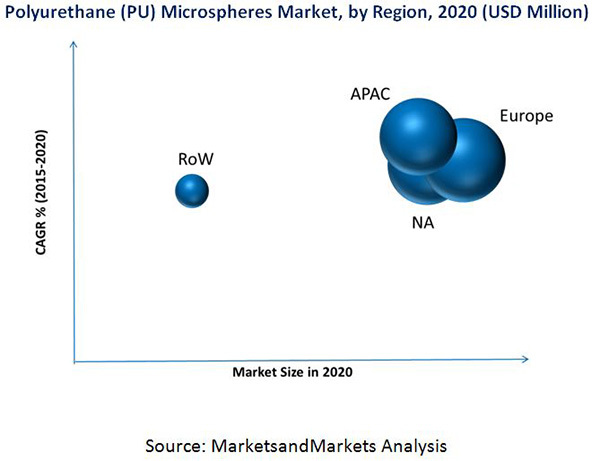 [109 Pages Report] The global Polyurethane (PU) microspheres market is expected to reach USD 74.4 Million by 2020 from USD 47.6 Million in 2014, growing at a CAGR of 7.8% from 2015 to 2020. The base year considered for the study is 2014 and the forecast period considered is from 2015 to 2020. This report provides a detailed analysis of the PU microspheres market based on application and region. The research methodology for this research study was devised with a combination of primary and secondary sources. Extensive secondary sources such as directories and databases such as Hoovers, Bloomberg BusinessWeek, and Factiva were used to identify and collect information useful for this technical, market-oriented, and commercial study of the PU microspheres market. The primary sources were used to validate the information obtained from secondary or derived sources via in-house methodology. The primary participants covered industry experts from core and related industries along with preferred suppliers, manufacturers, distributors, service providers, and related organizations to all segments of the supply chain of the industry. Furthermore, in-depth interviews of various primary respondents were included from subject matter experts (SMEs), C-level executives of key market players, and industry consultants, among other experts. A combination of primary and secondary information sources were considered while obtaining and verifying critical qualitative and quantitative information with respect to both, the present market and future expectations. The figure below shows the breakdown of the primaries participants conducted during the research study. The PU microspheres market has a diversified ecosystem of upstream players, including raw material [Methylene Diphenyl Diisocyanate (MDI), Toluene Diisocyanate (TDI), and polyols] suppliers, along with downstream stakeholders, vendors, end use applications such as encapsulation, coatings, adhesives, and cosmetics; and government organizations. Key players in this market include Microchem (Switzerland), Sanyo chemical industries Ltd. (Japan), Supercolori S.p.A. (Italy), Kolon Industry Inc. (Korea), Bayer Material Science LLC (Germany), Heyo Enterprise Co. Ltd. (Taiwan, Republic of China), and Chase Corporation (U.S.) among others. The government and research organizations, raw material suppliers and distributors, construction companies, and industry associations are considered as critical stakeholders in this study. This research report categorizes the global PU microspheres market based on application and region. The global Polyurethane (PU) microspheres market is projected to reach USD 74.4 Million by 2020 from USD 47.6 Million in 2014, growing at a CAGR of 7.8% from 2015 to 2020. The growing demand of plastic underbody and application in architectural coatings drives the demand for PU microspheres. Furthermore, the growing global demand for repositionable adhesives, technological developments in drug delivery, and crop protection via encapsulation is fueling the market growth for PU microspheres. 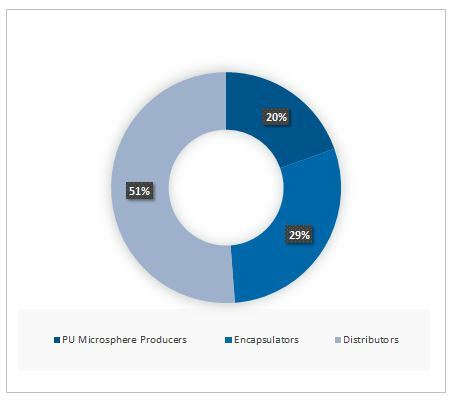 In terms of application, encapsulation dominated the PU microspheres consumption and accounted for the largest share of the PU microspheres market size in terms of value in 2014, owing to its huge consumption from various end use industries such as pharmaceutical, paints & coatings, and agro chemical industries. The major players in the encapsulation industry are backward integrated and hence a demand of approximately 70% is generated by companies that manufacture PU microspheres on their own. Technical feasibility problems such as inactivation of drugs during fabrication and poor control of drug release rates with the active agents is the reason why encapsulate producers tend to manufacture microspheres on their own. Asia-Pacific is projected to grow at the highest CAGR during the forecast period of 2015-2020. The regional market is primarily driven by the growth of major end-use industries such as construction, electronics, and automotive. China is the largest demand center in Asia-Pacific and accounts for over half of the total regional market volume. Various economic reforms in China over the last decade have helped the nation to emerge as the largest PU microspheres consuming country in the global market. The North American polyurethane market is characterized by its growing application in automotive and electronics. Evolving production technologies coupled with the growing importance for bio-based PU is expected to drive the Asia-Pacific market. Europe is the dominant market and is expected to exhibit considerable growth during the forecast period. The European region is a major consumer for wood coatings, architectural coatings, and plastic coatings for automotive underbody, and hence commands the major share by value in the PU microspheres market. The relatively higher cost of PU microspheres and the regulations on rinse off products would inhibit the growth of the market. Bayer Material Science, LLC. (Germany) is among the top players in the PU microspheres market and is among the world’s largest polymer companies. Its business activities are focused on the manufacture of high-tech polymer materials and the development of innovative solutions for products used in many areas of daily life. Bayer is constantly focusing on improving people’s quality of life by preventing, alleviating, and curing diseases and thus, achieving its goal by sustaining leadership positions in the markets, and creating value for their customers, stockholders, and employees. 8.3 Bayer Material Science, Llc. 8.6 Heyo Enterprises Co., Ltd.
8.8 Sanyo Chemical Industries, Ltd.